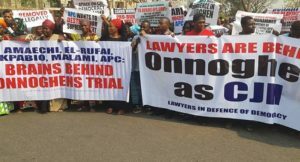 Group of concerned lawyers are currently staging a peaceful protest in Abuja to call for the reversal of the President Muhammadu Buhari’s suspension of Walter Onnoghen as Chief Justice of Nigeria (CJN). 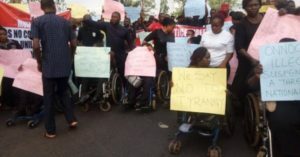 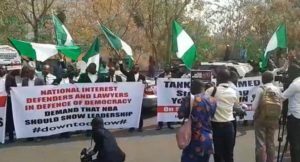 The placard-carrying protesters, who gathered in front of the National Secretariat of Nigerian Bar Association (NBA) vowed to sustain the mass action until Buhari rescinds his decision and follows due process. Some of the inscriptions on their placards read: ‘Tanko Mohammed Stop Parading Yourself As CJN’, ‘Lawyers Are Behind Onnoghen As CJN’, ‘NBA Must Act Now’, ‘Amaechi, El-Rufai, Akpabio, Malami, APC Behind Onnoghen’s Trial’, ‘Buhari Used a Fake Court Order To Factionslise Judiciary’. 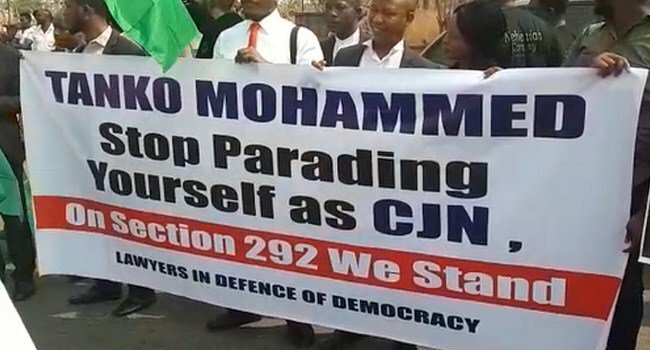 The leader of the group said his team would march to the US Embassy and National Judicial Council (NJC) and compel the body to take action. 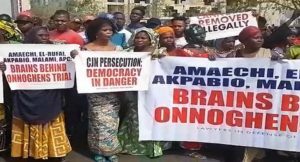 He called on National Assembly to reconvene and begin impeachment process against the President for gross violation of the constitution. 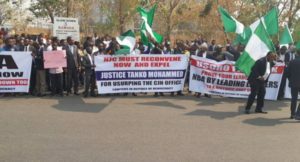 A truckload of armed policemen have been drafted to the venue of the protest to forestall any possible breakdown of law and order.